What are you doing at 4:30 a.m. on a weekday? That is the time my alarm goes off twice a week and the reason why I installed an automatic start on my car for added convenience. I am a loyal Five Fifteener, which means I along with about 8 others arrive ahead of the regularly scheduled 5:50 spin class. Our instructor offers the extended class during a time when he knows people are training for biking and running events. We all spin for reasons such as triathlon training, cross training and overall fitness benefits. It’s nothing for me to be next to an Iron Man competitor or group fitness class Instructor. 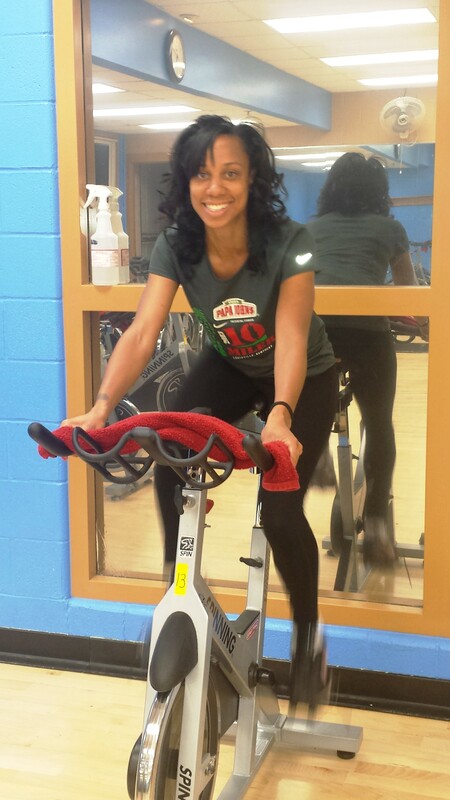 I find spinning to be harder than running but the results are amazing! I can attribute the surges I feel on my runs to the strength I have gained in class. The hour and 20 minutes I spend sweating my curls out has also given me endurance for the longer races I have finished. 1. Low impact and easy on the joints. 2. High calorie burning workout. 3. Increased cadence on bike increases running tempo. 4. Good music and good people. None of my summer clothes from last year fit because I am currently a size 4. I have dropped 2 dress sizes since last summer. My weight stays between 135-140 but I have gained a lot of muscle which we all know weighs more than fat. I have never been a size 4 in my life! I like how I feel and look. Now please excuse me as I finish off this warm, chocolate brownie with vanilla ice cream. This entry was posted in Uncategorized and tagged Aerobics Class, Louisville, Spin Class, Spinning, YMCA. Bookmark the permalink. 8 Responses to Get Your Spin On! Hey Steve! I need to incorporate yoga into my schedule. Flexibility along with a strong core go a long way. I need to learn that it’s OK to take a rest. I’m very mentally hard on myself. Is Celiac something that needs to be tested regularly? 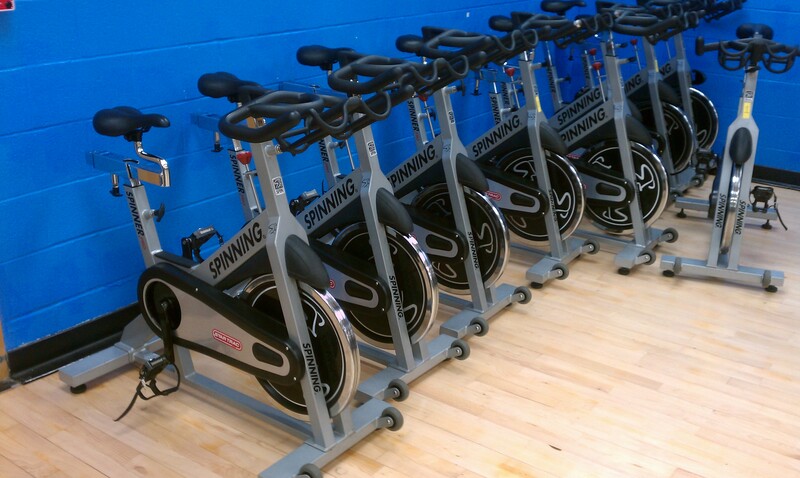 I am going to try out my gym’s spinning class this coming month as I need something to cross train with. 🙂 Very excited about it…and respectful of it as well. I hope it helps me out. I was told I am actually underweight for my height, so building up muscle would be very ideal and make my physician very happy. Hoping to meet with a sports nutritionist very soon. Does the gluten free diet keep your weight down? As for the weights, my instructor is the only one at the Y who incorporates them in our workouts. Have you tried regular strength training to build more mass? I said I was going to hit the weights and do yoga at least once a week but they both seem so boring! I like cardio! Cardio is definitely more fun, but you gotta rest those muscles too. Which is why strength training and yoga are fantastic options. I actually do both. 🙂 I do circuit training on days I do not go to the gym…get my weights on. And days I do hit the gym…it’s a yoga night for me. Stretches out all those worn out, torn muscles and gets them ready for repair. As for the gluten-free diet…the ‘fad’ dieters use it to lose weight, but most gluten-free foods are actually higher in calories and fat in most cases (which is why I normally just make my own). The gluten-free diet is not for people who do not need to go gluten-free. For me, it had to happen as I was diagnosed with Celiac. My mom was yesterday. So now I’m helping her begin her gluten-free lifestyle.